Dell Storage introduces the latest technology in the MD Series of direct-attach storage enclosures designed to maximize your server storage capacity. The MD1420 offers low-cost storage expansion with double the bandwidth using 12Gbps SAS connectivity to support your growing application workloads. As data continues to grow, the need to store and access that data increases exponentially as well. 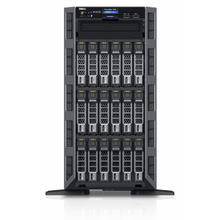 The Dell Storage MD Series offers affordable storage expansion for Dell PowerEdge servers. The MD1420 model is designed to scale capacity behind Dell’s 13th generation of PowerEdge servers, without busting your storage budget. When cost is an issue, and you need to optimize your cost per terabyte, the MD Series offers a simple and cost-effective solution while ensuring your performance requirements are met. The intelligence of the Dell PowerEdge RAID Controller (PERC) H830 HostRAID adapter, which enables the software to recognize all of your storage as a single unit, helps increase reliability and fault tolerance. You can place up to eight MD enclosures behind a PowerEdge server using a 12Gb SAS HBA or the PERC9 series with a 12Gb RAID controller. Directly connected to your PowerEdge server, either configuration gives you a viable storage solution, creating an end-to-end performance centric 12Gb solution. The MD Series offers the versatility needed to meet both your storage capacity and performance requirements. The MD1420 model is specifically designed to work with the latest PowerEdge servers using the PERC9 series of RAID controllers with 12Gbps SAS offering unmatched I/O performance for database applications, streaming digital media environments and storage intensive applications. Meet your high-capacity storage requirements with the MD Seriesby choosing the drive type and speed that meets your data center specifications. The MD1420 model offers the flexibility to mix and match NL-SAS, SAS and SSD drives within an enclosure to assist with your data tiering initiatives. With the option of either 12 or 24 hard drives in an enclosure, you can scale non-disruptively to meet your application demands. The MD1420 supports 24 2.5-inch hard drives in a 2U form-factor, expanding up to 8 enclosures and up to 192 hard drives supporting high storage capacity requirements. Leveraging the technology and design of the 13th generation of PowerEdge servers, the MD1400 and the MD1420 use the same hot-swappable drives, fans and power supplies to minimize the cost of spares. If drive security is a priority, the option to use self-encrypted drives (SED) with drive-level encryption ensures your data is secure, even if the drive is removed. Additionally, SEDs support instant Secure Erase of drives which permanently removes data when re-purposing or decommissioning drives. Data can be managed simply through Dell OpenManage™ system management technology, leveraging iDRAC (Integrated Dell Remote Access Controller) to help simplify and automate your most essential management tasks across server, storage and networking platforms in multi-hypervisor and OS environments. You can manage both the internal and external storage as a single interface, optimizing performance with the end-to-end 12Gbps connectivity. This helps reduce resource load on the system, andenables easier navigation for the user. If your data management has standardized on using Microsoft® Windows Server® 2012, you can take advantage of the many features offered with Storage Spaces, including automatic storage tiering and disk resiliency. When combined with Dell’s storageoptimized PowerEdge servers and the new MD Series of expansion enclosures, you have an affordable direct-attached storage option in Microsoft environments.